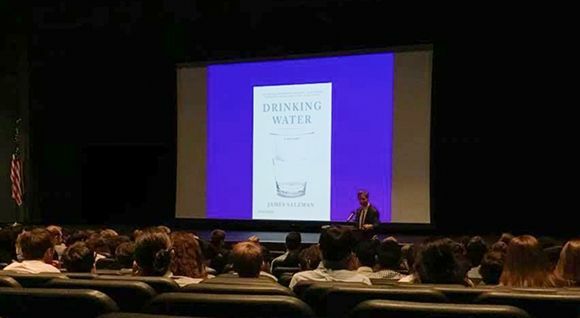 Last Friday, Professor James Salzman visited Shorecrest Upper School to talk about his book “Drinking Water: A History” for the first Willis Leadership Lecture of the year. Mr. Salzman is a distinguished scholar and a family friend. He is an honors graduate of Yale College and Harvard University, where he earned degrees in both law and engineering. He is the Donald Bren Distinguished Professor of Environmental Law with joint appointments at the UCLA School of Law and the Bren School of the Environment at UC Santa Barbara, where he takes his students surfing after final exams. A dedicated teacher, Mr. Salzman was twice selected as Professor of the Year by Duke students, and he has served as a visiting law professor at Harvard, Columbia, Stanford, and Yale as well as in Australia, China, Israel, Italy, Portugal, and Sweden. He has written 9 books and his numerous articles have been downloaded over 90,000 times. My family met Mr. Salzman in Tanzania, where he taught us the critical importance of water issues in Africa, and he has taught countless people about environmental policy on every continent except Antarctica. When addressing the Upper School in the Janet Root Theatre, Mr. Salzman presented slides and stories focused on the ancient and modern question of whether water is a right or a privilege. Using examples from ancient Rome, New York City, Michigan, the western United States, South America and Africa, he talked about ways in which water has been and is sold and legislated. He examined biblical and Islamic law and the Right to Thirst that has ruled the Middle East since antiquity. Afterward the Lecture, Professor Salzman met with students in the Global Scholars Initiative program, as well as students who chose his book as their summer reading selection.